Stuck for ideas for your iPhone-wielding loved one this Christmas? Don't fret as Little World Gifts believes it's got the answer, in the form of 3D virtual gifts. 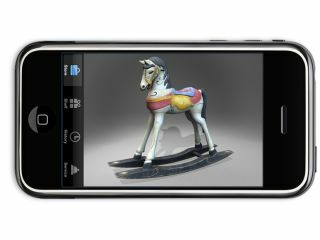 Much like the online pressies you can send to people on Facebook, Little World Gifts allow "iPhone and iPod touch users to send each other beautiful 3D virtual gifts that they can touch, move and play with". And don't think that what is being sold is Made in China tat, as Little World Gifts is a Liverpool-based company that's been around since June of this year. Speaking about the 3D gift idea, Little World Gifts co-founder, Katie Lips, said: "Mobile gives us a chance to do more with virtual gifts than anyone has before. By using the unique features of the iPhone, Little World Gifts redefines virtual gifts, giving them the charm and personality of a 'real world' present you'd want to send or receive yourself. We want people to see virtual gifts as more than representations of real world objects." The gifts can be delivered in real-time using push notifications, so if you wake up Christmas morning in a cold sweat over forgetting a loved one, then this could be for you. Go to www.littleworldgifts.com for more details.